Discussion in 'Biomechanics, Sports and Foot orthoses' started by Dr. Steven King, Nov 19, 2018. Sure cool I'll do that. I have the accumen to understand this science. Safer Soldiers? How can i help? US Army Small Business Innovation Research contracts with awards in the hundreds of thousands of US dollars have been spent on the follow two Advanced Composite Combat Boot Orthotic Systems. PHASE I Contract Objectives: Phase I will include multiple concept designs and development of a working orthotic. The prototype will be supported with an analysis of the predicted biomechanical performance benefits, such as the reduction of internal load and the increased energy return of the orthotic. Performance considerations for the orthotic should include: 1) outperforming ASTM F2412-05 puncture standards; 2) reducing combat boot weight by >10%; 3) reducing injury risk by >10%; 3) a significant decrease in oxygen consumption; 4) be fire retardant; and 5) increase subjective comfort ratings by 10% when compared to traditional combat boot. Please Compare and Contrast the work and innovations of the two contractors. Lives and Limbs depend on the better science. To be fair we should also include Nike's Vapor Fly 4% in this composite comparison with their rear and aft leaf spring shoe midsole system. How does this differ from the mechanics of the leaf spring prosthetic feet we have been building since the 1970's? Removing foam gives us more room to roam. Nike Shoe with carbon fiber midsole insert. Kind of looks like Nike has patented a device that has been sold by OrthoBaltic and Otto Bock for over 20 years now. ?? Are both foot plates the same, that is, the product from Cascade and that from Orthobaltic? I am not sure if they are exactly the same. They could have different carbon fiber layup schedules and different resin systems that would change the elastic modulus but the shape is the same thus the mechanics will be very similar. Rieckens also has a contoured carbon fiber leaf spring plate. Question why is the distal end of the Nike spring plate pre-bent upward? Wouldn't you want to the spring to be more flat so you could load it more? They have to pre-bend the springs to fit into bent foam shoes that have a bent toe-spring modification made to the last. They cannot figure out how to make a flat plate comfortable on the metatarsal heads. "The toe spring reduces the resistance to flexion that the shoe places on the foot when the foot is flexed at the MTPJs, and thus reduces both fatigue during walking and wear at the vamp area of the upper"
Why do we do this if it has been reported the stiffness at the MPJ's is directly related to the power and stability of gait? The horse is stuck behind the cart. Here is another entry by VKTRY Gear into the carbon fiber race. It use a concave carbon plate that provides a heel and forefoot leaf spring. The website claims some interesting testing results. It is of the opposite design from the Ottobock-Acor-Springlite-Rickens-Ossur-SpryStep-Nike foot plates with a convex shape-contour. No mention of the elastic spring modulus value is given on the website. "Simply by putting VKs into your shoe or cleat, you can rapidly generate more force into the ground. This combination of increased ground force (+8.1% peak force) and increased explosiveness (+9.3% rate of force development) immediately translates to running faster and jumping higher. 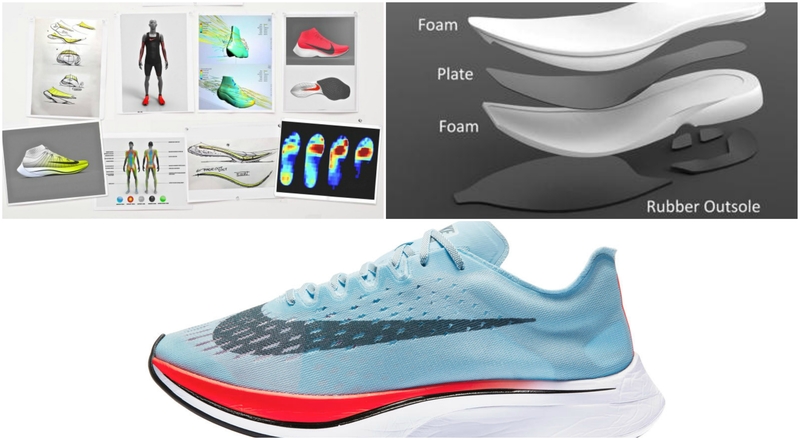 Most sports insoles are made from foam and plastic and provide virtually no energy return." Website How it Works Page. I wonder how much more loading the metatarsals and heel take on with this design?